The BBL910XL the Boss™ – How do you make frozen desserts without preservatives, nut butters without salt and sugar, hot soups without flavorings, mayonnaise without emulsifiers, soy milks without stabilizers, and, of course, green smoothies you don’t have to chew? The BBL910XL, the Boss™, with 12 speed selections, preset functions for easy use, and an extra large 2 liter blending jug, it’s the only blender you’ll need. It’s the Boss™. A. 2.0 Liter BPA-Free Jug. B. ProKinetix® Extra-Wide Blade/Bowl System. C. Heavy duty Metal Coupling. D. 1500W Motor. E. LCD Timer and Display Panel. F. Die-Cast Metal Base. G. 5 Preset Programs. H. Overload Protection. I. Manual Speed Control. J. Scraper Spatula. K. Frozen Desert Wand. L. Outer Lid. M. Inner Lid. Not Shown Breville® Assist™ Plug. A. ON/OFF Button - Powers the blender on and into 'READY' mode. 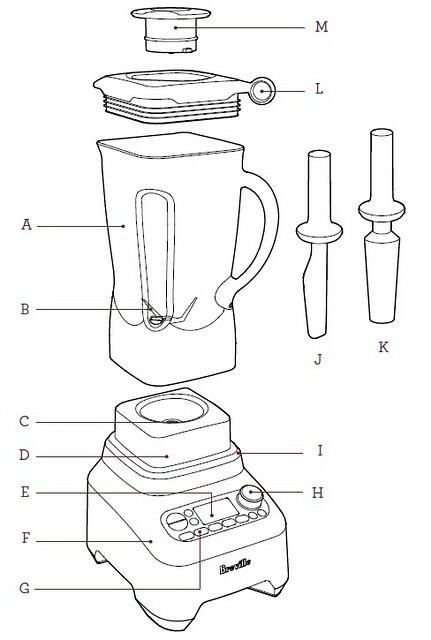 B. START/CANCEL Button - Turns on the manual operation of the blender. C. PULSE/ICE CRUSH Button - Pre-set function to crush ice, automatically sensing when the ice is done. D. SMOOTHIE Button- Uses high speed and pulsing for maximum aeration and smoothness. E. GREEN SMOOTHIE Button- Uses high speeds to break down greens, even leafy greens into incredibly creamy smoothies. F.FROZEN DESSERT Button - Optimized for the breaking down and combining of frozen foods with the help of the Frozen Dessert Wand. G. SOUP Button - This pre-set program runs for 6 minutes and not only blends your soup to exceptional creaminess but heats it at the same time. H. AUTO CLEAN Button - This pre-set button takes the major cleaning and automates it with the simple touch of a button. I.PAUSE/PLAY Button - The pause selection will stop the currently running function, holding the blades still and stopping the count-up/count-down for up to 2 minutes. Play resumes the function. J. The bottom bar of the LED Speed indicator is the 'READY' display. This single bar lights up once the blender is powered on. K. 12 selection SPEED DIAL allows you to choose from a slow Stir up to a very fast Mill in the manual mode. L. LCD Speed indicator. This indicator shows which setting you are on in correspondence with the dial. M. OVERLOAD PROTECTION - The LCD will display when exceptionally heavy loads or over current situations cause the blender to trip the Overload Protection. N. COUNT-UP/COUNT-DOWN Buttons - This allows you to adjust the time, either up or down on manual mode and down only on the pre-sets.